These super small LEDs are known as surface mount LEDs or Chip LEDs. They are tiny but bright LEDs and are some of the very smallest Chip LEDs available that still give a great amount of light. 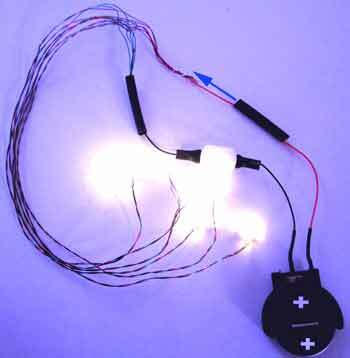 We have taken these SMD Chip LEDs and added 8 inches of red and green superfine magnet wire. From 1 - 10 of these bulbs can be powered by a single coin cell battery. This set contains one coin cell battery, one coin cell battery holder with on/off switch, shrink tubing, instructions and ONE LED light. Use the pulldown menu to add additional LED lights to your package.